Reliance Communications (RCom) has begun the process to move their CDMA customers to the 4G/LTE, which we have shared earlier. RCom, headed by Anil Ambani is going to launch LTE on 800Mhz band which is partially owned by them, and partially shared by Jio and partially coming from the merger with MTS India. There are many confusions regarding Rcom’s 4G launch. Let us decode the Rcom 4G/LTE. * As Rcom is going to use its 800Mhz spectrum for LTE deployment, their CDMA voice and data customers will be affected most. Hence CDMA subscribers will be migrated first to 4G, later Rcom 4G will be open to all. In short unless you are a Rcom CDMA subscriber (prepaid/postpaid ; voice or data card users) you can’t use Rcom 4G right now, not even R-GSM subscribers. 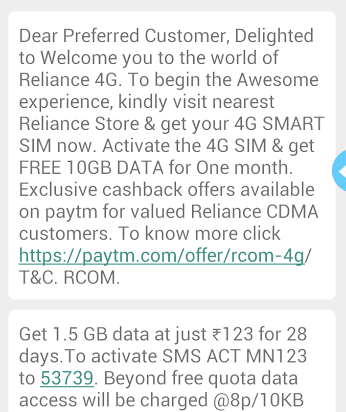 Rcom already stopped selling new CDMA SIMs. * If you are an existing CDMA customer, you need to register for 4G upgrade by dialling 1299. Then you have to visit nearest Reliance Store for the 4G SIM card in exchange with your old RUIM. This is upgrade of your SIM, so document submission not required. * Now when you are upgrading to Reliance 4G, your core balance will be carried forward, but not the promo packs. You will get the introductory offer of 1GB LTE data, 150 minutes of offnet calling and unlimited onnet calling for 30 days. Post that local or STD calling tariff will be 1p/sec. With the handsets bought from PayTM the free data will be 10GB. There are more details regarding voice tariff coming soon. Rcom’s 4G voice will not be VoLTE, rather RCom’s 1x/2G network. * Rcom’s online shopping portal shows the 4G MiFi device, and existing Netconnect+ and WiPod users can be migrated with their existing plans. We are yet to sure is it for all or only for postpaid users only. * As Rcom is yet to merge with MTS, and MTS keeps inviting my R-CDMA no. to their network, it seems that Rcom’s 4G services will be based on Rcom-Jio spectrum sharing on 800Mhz.